AUDITOR General Odysseas Michaelides has argued that the government cannot be held accountable for the land slippage in Pissouri and that the Interior Ministry should first consult the Attorney General before compensating affected homeowners. Michaelides argued that the responsibility for evaluating the structural calculations before building the houses, should have normally been in the hands of a engineer appointed by the land development company that sold the properties. He added that the fact that authorities check the structural calculations does not exempt the engineers of their responsibility as it is they who sign them. Michaelides described a possible decision to compensate affected homeowners as a “gift to land developers who sold the properties to unsuspecting buyers”. He also claimed that a whole residential complex in Pissouri which is now suffering from serious damages was sold by “a single, well-known land development company which will now be relieved of its responsibilities”. Moreover, the Auditor General argued that providing compensation to homeowners will create a precedent as the Republic will essentially accept the responsibility for issuing a construction permit based on inadequate structural calculations. “According to the Road and Building Law 9A(5), land developers should conduct their own structural calculations with their own civil engineers,” Michaelides added. “Will we now consider that civil engineers working in District Offices have the responsibility for the hundreds of structural calculations that pass through their hands each year?”, the Auditor General wrote, concluding his letter. On February 25, an Interior Ministry representative told Parliament that the government will compensate Pissouri homeowners whose houses have been affected by land slippage. A proposal for a lump sum payment to families whose homes have suffered irreparable damage will be submitted to the cabinet, he said. A slow-moving landslide which has caused damage to the soil and houses is affecting the area “Limnes” in Pissouri, as the village is located in a geologically problematic zone. Pissouri residents have been raising the problem since 2012, when the land slippage first appeared in the village. Since then, many houses have sustained enormous damage. It is easy to “intervene” and to say whatever you want when you are safe in your home, you get your salary, you are safe because of your position whatever happens, and no one controls you. Hell NO!! It is not a gift to any developer who did not make proper structural studies to compensate the victims of the landslide in Pissouri. Auditor General (AG), rather than pretending to be tough against eight-year-olds, should check on those who gave him the false information to issue his announcement. Those who are responsible for the project on Anexartisias Street in Pissouri, who cut off the flow of water coming from the village square and re-diverted it in the area of the ancient landslide​​ and re-activated it the next year from the construction of the project. Those who for years have refused to develop water management infrastructure in the area (perhaps because they knew that the largest amount was not from rainwater or sewers but from the work they built). Those who tried from the first day to deceive everybody in order to avoid any control of the real cause of the flood in the area of the ancient landslide. And they misleadingly used and continue using the word “Limnes” which means lakes in Greek, a locality that was actually used only for a field with mulberry trees. Those who, even when they realized that there was an active landslide, continued to talk about “local settlements”, continuing to mislead. Those who have spent €700,000 in the last three and a half years filling fissures on empty fields and roads, repairing over and over and over again the same roads, the same sidewalks, not to admit they were wrong. Those who delay, lie, mislead the House of Representatives of the Cypriot People and the Media (although the latter should know better and do research before publishing the allegations of government officials). Those who were utterly cruel and inhumane when in the Parliament a month ago gave hope to people who have been literally tortured for seven years, only to have now the Auditor General to advise against offering them any help. SHAME!!! I cannot describe how angry I am. The video was produced by Nigel Howarth, as you will see if you watch it, until the credits at the end of the six minutes. Well worth watching. The damage is much worse now. It’s a pity the Auditor General hasn’t looked, before he misspoke. There were numerous developers involved in the Limnes area, and they are not responsible for the current landslide. When the properties were built 20 to 30 years ago it was not possible then and it is not possible now to predict a landslide. It is also not possible to design a building to withstand one. 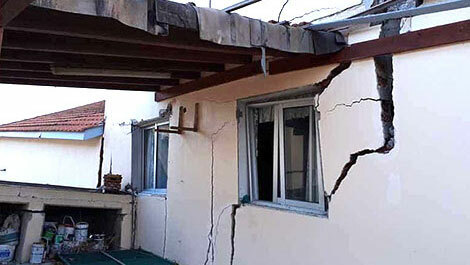 An independent survey by an engineer appointed by the Technical and Scientific Chambers of Cyprus has declared that the buildings were sound and that the ground was unsuitable. A world renowned Geotechnical Engineer, Dr Gareth Hearne has established the presence of this landslide following two surveys of the area and with the use of the InSar Satellite Monitoring system, which has proven that there has been 90cm movement in a year and in one month 30cm. Over the past two to three years there have been hundreds (yes hundreds) of repairs carried out to the underground potable water system pipework, as ground movement pulls it apart. In the last two weeks there has been four underground armoured electric supply cables sheared due to ground movement. There has been Electricity Department Workers here at 1-00 am installing new power poles. In short we are beyond the blame or the responsibility phase and we in Pissouri are looking to the Government of Cyprus to face up to the situation here in line with guidelines established by the EU. The rain continues and together with all waste water from the village households is adding to the level of the aquifer upon which Pissouri sits. It does not take much imagination to see where this is going. I understand that Mr Michaelides was once a Civil Engineer, well he should make the effort and visit the area to fully understand the situation himself, before writing to the Attorney General with his advice based on information supplied by others who also have not visited the area. Sorry, but the buck stops with the Developers. And they will have to put hand-in-pocket for once. Ed: Most of the houses were built many years ago – and it’s only a few years ago that the landslide started. If you read the lawyer’s comments you’ll see what caused the ancient landslide to start moving again. I have a copy of the independent study that looked into the cause of the landslide.